Hearing God’s call to serve as a missionary in the French-speaking world, Joe Portale responded with excitement, boldness, and humility. His lifelong dreams were being fulfilled, and the land God had promised was within reach. But the journey was not easy. 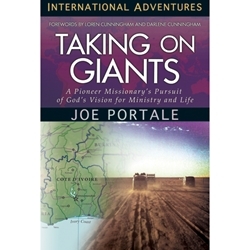 From spiritual forces in France to the perilous Sahara desert to war and poverty in Southeast Asia, Joe and his ministry team persevered through many challenges. Their successes and failures provide a roadmap for all who would respond to God’s call, an instructive account of pursuing one’s life vocation and ministry. "This inspiring story is . . . a gift of wisdom from an older movement to the new pioneers of global ministries." JOE PORTALE and his wife, Judi, joined Youth With A Mission (YWAM) in 1969. They launched YWAM’s French Ministries in Switzerland, France, and French West Africa and YWAM’s ministry to refugees in Thailand. Joe served at the University of the Nations (U of N) as the international associate dean of the College of Christian Ministries, and now works with the U of N in Kona, Hawaii, training the next generation for missions.